There was a point in this semi-final when it had looked as though Chelsea were simply going to be overwhelmed. They can reflect on a spirited effort during the final exchanges but it is no good playing well for only the last third of a match and hoping to get away with it. Roberto Mancini’s team won not just because they had more verve in attack but also because they were far less erratic and, from here, it is difficult to envisage them not returning the trophy to Manchester. They had pinned Chelsea back for much of the opening hour and, however great their relief at the final whistle, Mancini was entitled to point out they probably had enough chances to spare their supporters that nerve-shredding ordeal in which Chelsea’s late, desperate efforts were epitomised by David Luiz all but abandoning defence to join their attack. Rafael Benítez’s team finished with virtually half a team encamped in the final third of the pitch as they tried to recover the goals from Samir Nasri and Sergio Agüero. Yet City defended with great togetherness during the considerable pressure that followed Demba Ba’s goal midway through the second half. These were moments, too, when Costel Pantilimon fully justified Mancini’s decision to play him at the expense of Joe Hart. 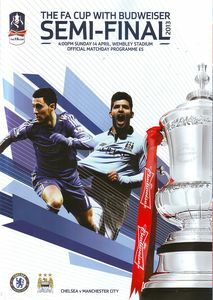 Pantilimon has featured in all of City’s FA Cup ties and coped so well that Mancini immediately promised that the Romanian would keep his place when the team return to Wembley to face Wigan Athletic on 11 May. City, looking to win this competition for the second time in three years, have been installed as 1-5 favourites. If they play as they did for the opening hour, it is difficult to see how Wigan will stop them. City had dominated that period to such an extent, passing the ball with great purpose, that the late drama that occurred had barely seemed plausible. Agüero and Carlos Tevez formed a strike partnership of great menace, both operating with a licence to roam, such elusive and dangerous opponents. 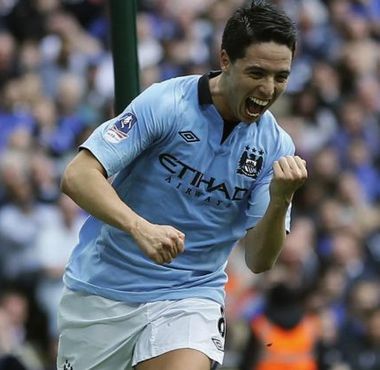 Nasri showed why Mancini has been willing to persevere with him. David Silva’s absence with a hamstring injury could have been a considerable loss. Instead Mancini’s team began the match precisely as they had left off against Manchester United the previous Monday. This is the fourth time they have played Chelsea this season and they have been the more refined team on each occasion. 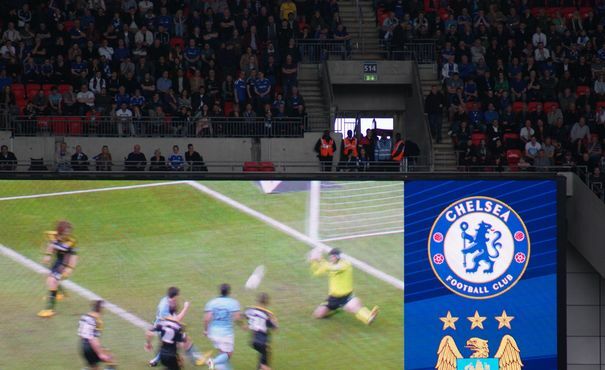 They had already started to pin Chelsea back well before Nasri put them into a 35th-minute lead. Yaya Touré, the game’s outstanding player, started the move with one of those powerful surges through the centre of midfield. Nasri ran on to Agüero’s lay-off and César Azpilicueta could not get a clean tackle on the Frenchman. The ricochet was kind to Nasri and he swept in his goal from six yards. It arrived at the first point of the match when Chelsea had started to emerge from their own half. For the most part, however, Juan Mata, Eden Hazard and Oscar were only on the edges of the opening45 minutes. Chelsea looked flat and unimaginative, perhaps a little weary, too, bearing in mind their unforgiving schedule. It was rare to see one of Benítez’s teams playing with such little cohesion and structure and, defensively, so poor at keeping a straight line. Chelsea badly missed John Terry – not the fading Terry who had struggled against Rubin Kazan last Thursday but the organiser of old. Agüero’s goal was a perfectly angled header from Gareth Barry’s cross and, at that stage, there was little sense of a possible comeback. Agüero was a constant threat, though fortunate late on that his studs-up lunge at David Luiz was not punished. James Milner made it a difficult day for Ryan Bertrand, deputising for the injured Ashley Cole, and Touré, in particular, was excellent, as close as there is to the complete midfield player. Yet the complexion of the game changed immeasurably when David Luiz’s long ball went over Vincent Kompany and Ba swivelled away from Matija Nastasic, then hooked his shot past Pantilimon. Suddenly it was City’s turn to look anxious, while still highly dangerous on the counterattack, exploiting the gaps that appeared as David Luiz and othe rs took up more advanced positions. It was a breathless finale that saw Pantilimon save brilliantly at Mata’s feet, keep out another effort from Ba and Fernando Torres so aggrieved that he had not been awarded a penalty after grappling with Kompany he sulkily gestured that the referee, Chris Foy, needed glasses. Pantilimon’s only moment of hesitancy came in the first half when he misjudged the flight of Mata’s free-kick but was spared greater scrutiny because Kompany was able to clear Hazard’s shot from the line. Chelsea should probably have done more in this period to test the goalkeeper’s nerve. As it is, all they have left is the Europa League. For City there is the prospect of the third major trophy of the Mancini era – not the one they wanted, possibly, but a trophy they would cherish all the same.